I wouldn't say I was fanatical about planning trips or anything, but, by the time the morning of Saturday, 6th June arrived, you could say I was organised. The pets had been despatched (bunnies to Dolbeare Cattery; fish to the Blomeley house); itinerary lists, containing flight numbers, phone numbers of hotels, condos, house owners etc, had been handed out to father and to Nick; our three (two new, black with white hibiscus pattern) suitcases contained our personal clothes (enough for several weeks); the red holdall contained a pillow, toiletries, a bag of medicines, lotions and ointments for every occasion: hydrocortisone, E45, dry eye drops, Canestan and calendula - Jungle strength insect repellant spray and towelettes, suntan lotion, SPF15 and SPF30, apres sun - an Egyptian cotton king-sized sheet, in case any of the bedding was scratchy, a bear and an owl; the rucksack held books, notebooks, pens, adaptors for Nintendo DS (UK and US), phone, cameras, batteries, hard sweets (to keep eustation tubes open during take-off and landing), and one of the three bags of 'TSA approved' on-board liquids. This one contained hand-wash stuff, deodorant and 'sanitizing spray'. The other bags contained, lipsticks, perfume, mascara, Rescue Remedy, (chesty) cough medicine, Otrivine Nasal Spray decongestant and Isotonic Sea Water Microdiffusion spray (I had a cold). In the side compartment of the laptop bag, there was the folder of paperwork - airline e-tickets, every email I'd every exchanged with each of the condo/house owners, hotel reservations, hotel cancellations, an itinerary in calender form. Important enough to be carried in hub's 'man bag' was the wallet containing passports, insurance documents, copies of passports, an itinerary in list form and a proof of purchase for the laptop (which had been there for four years). I was bound to have forgotten something. No surprises. We waved to the rabbits as we passed. We bought sandwiches from M&S Simply Food somewhere. We arrived at the Marriott unscathed. No surprises, except that the beds were not as they were. They were lumpy and hard and the bedding felt 'fluffy'. And the McDonalds down the road was 'out of action'. 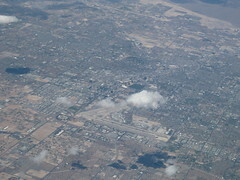 We found another a bit further along and shared a car-park with airline spotters to eat our buns. We set the mobile alarm to 7:00am and drugged ourselves with cheap wine. I was down early to the smoky hole (7:03am), wearing sandals, and it was raining into large puddles. Four more visits later and it had eased a little and we dragged down our luggage and asked for a cab. 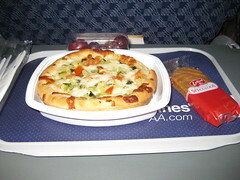 I'd bought our tickets with American Airlines as theirs were £600 cheaper than BA's. So we had to go to Terminal 3; never been there before. We got stuck in an underpass for ages; traffic was bad; an accident. I also felt congested. Where was the Otrivine? 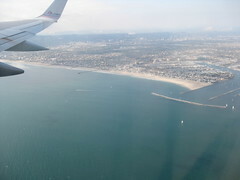 Certainly the flight attendants on the American Airlines Boeing 777 to Los Angeles, were showing signs of wear. It was a comfortable flight. 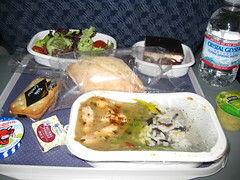 And the food was decent, if not extraordinary (it's always 'chicken or pasta?' isn't it?). We sat together - the three seats by the window - and we each had a 'back of seat' video screen, showing various movies, TV shows, flight map, etc. I found that trying to BrainTrain with the DS was difficult at 38,000 feet and my brain age was something like 40, so I gave up on that form of entertainment and concentrated on looking out of the window. 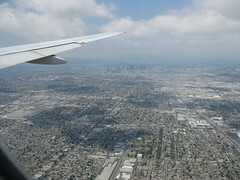 Until, that is, one of the flight attendants told me to pull down the window shade so that people could sleep. Why? Why would they want to sleep en route to LA? Surely they should be keeping awake! 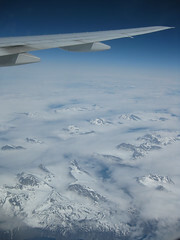 Besides, it was daylight, mostly clear skies, and the views over Greenland, stupendous. I didn't close the shade totally. I felt like a naughty schoolgirl. 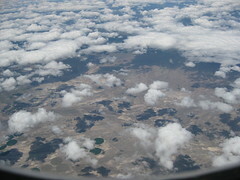 Later, we had views over the Utah desert and over Las Vegas and LA suburbs. And pizza. 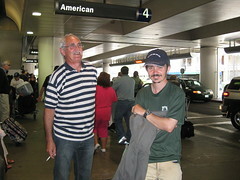 We landed at LAX at about 2:00pm, Pacific Time, sailed quickly through immigration and security (not nearly as many aliens on an AA flight as on a BA flight), picked up our luggage, dropped off our luggage and went outside for a smoke! 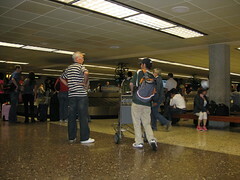 Then we had to get to a different terminal (I think; memory is poor; didn't write notes) for the 7:40pm flight to Honolulu. 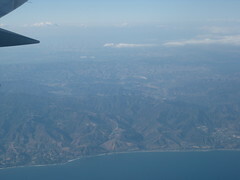 This one, apart from some smashing views over Santa Monica, Malibu and the Channel Islands, on our take off, was uneventful and pretty boring and the Pacific Ocean stretched out endlessly below us, and no food was offered (unless you paid). 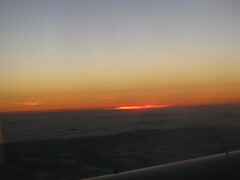 Through the sunset, we landed at Honolulu Airport at 7:40pm local time. Not once, during eighteen hours or so of pressurised cabin that day, had I experienced excrutiating ear pain, deafness, exploding face or cataclysmic headache. It's all in the preparation, you see. And in the seawater microdiffusion spray.